Dr. Samuel S. Badalian, Clinical Professor of Obstetrics/Gynecology and Urology at SUNY Upstate Medical University in Syracuse, along with his colleague Dr. Elena Sagayan from Kaiser Permanente Hospital in California, traveled to Armenia to hold a three-day workshop in urogynecology (also known as Female Pelvic Medicine and Reconstructive Surgery) for regional doctors. The workshop used demonstration of live surgeries and lectures on particular case studies and theory to explore the specialization. The issue is lack of education, he said. The medical education system in Armenia is the biggest problem as they don’t teach their residents about urogynecology. There are no fellowship programs, centers, or any other established programs. “And who suffers from this? Armenian women! So, I want to start educating them on how to fix that. Armenian women do not deserve to suffer; they deserve to live with a high quality of life. That’s why I want these doctors not to be afraid to do these types of procedures,” he said. Dr. Harutyun Karapetyan, Head of the Obstetrics/Gynecology Department at Dilijan Medical Center, was pleased with the workshop. “It was very useful to first participate in actual surgeries and then also get better acquainted with the theory. We don’t do a lot of surgeries in the regions, but they are needed at times and we need to be prepared. 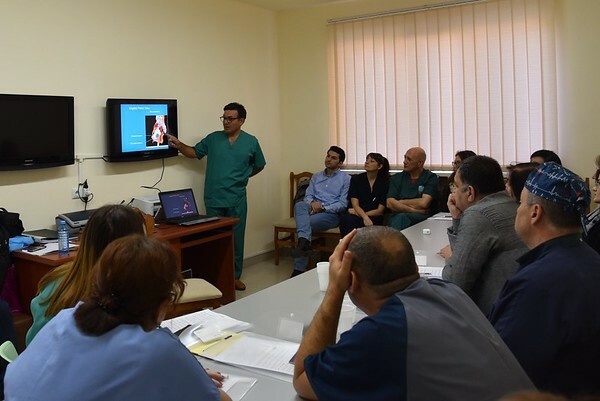 We also learned quite a bit about the proper medicals tools to use as well, which also was very useful,” Dr. Karapetyan said. Participants received 10 professional development credits for participating. Such credits are mandatory due to a recently revised regulation in Armenia that requires doctors to earn 220 credits every five years in order to maintain their medical licenses.